Below is a simple assessment which can be used to try and gauge the degree of pain your cat may be suffering as a result of arthritis, or some other similar joint disorder. Please note that this is just a very simplistic form of assessment, and it is always recommended that you seek advice from a veterinarian if you suspect a problem could be developing and your cat is suffering from sustained symptoms of pain. There are many conditions which can lead to pain in these regions so it is important that you get an accurate diagnosis, so that a suitable, effective treatment plan can be implemented. Select the box based on the extent to which you agree or disagree with the statement and how it relates to your dog. Select one box for each each of the questions. Click the 'Evaluate Responses' button when you have answered each question as accurately as you can. Please indicate to what extent you agree or disagree with the following statements. 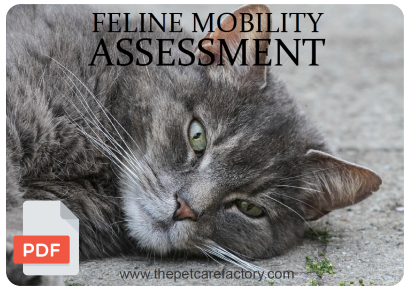 Each response will be assigned an individual score, which collectively will help to give an assessment score which will help to determine the degree of joint pain your cat is experiencing. Please choose one option for each of the statements. Based on your responses to the survey questions, your cat appears to be showing very severe arthritic symptoms. Based on your responses to the survey questions, your cat appears to be showing severe arthritic symptoms. Based on your responses to the survey questions, your cat appears to be showing moderate arthritic symptoms. Based on your responses to the survey questions, your cat appears to be showing mild arthritic symptoms. Based on your responses to the survey questions, your cat is probably not affected by arthritis. * Based on a concept derived from Hill's Mobility Calculator, with additional thanks to Sydney Animal Hospitals (NSW). We also have the assessment available as a free download, in PDF format. As well as explaining how to best use the assessment, the document contains a blank form included which can be printed off for carrying out the appraisal. The guide additionally has a table for recording your results over time together with an example of a completed form which shows how the scoring works.